The Workers' Party of Marxist Unification (Spanish: Partido Obrero de Unificación Marxista, POUM; Catalan: Partit Obrer d'Unificació Marxista) was a Spanish communist political party formed during the Second Republic and mainly active around the Spanish Civil War. It was formed by the fusion of the Trotskyist Communist Left of Spain (Izquierda Comunista de España, ICE) and the Workers and Peasants' Bloc (BOC, affiliated with the Right Opposition) against the will of Leon Trotsky, with whom the former broke. The writer George Orwell served with the party's militia and witnessed the Stalinist repression of the movement, which would help form his anti-authoritarian ideas in later life. 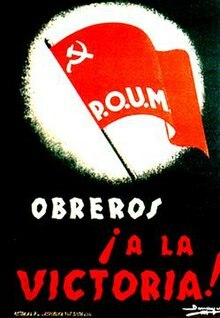 In 1935, POUM was formed as a communist opposition to the Stalinist form of Communism promoted by the Soviet Union, by the revolutionaries Andreu Nin and Joaquín Maurín. Nin was heavily influenced by the thinking of Leon Trotsky, particularly his Permanent Revolution thesis. It resulted from the merging of the Communist Party's Left Opposition – the Trotskyist Communist Left of Spain – and the Right Opposition – the Workers and Peasants' Bloc. This alliance was against the wishes of Trotsky, with whom the Communist Left broke. A c. 1936 POUM poster appeals to workers: "Obreros ¡A la victoria!" ("Workers: to Victory!"). The party grew larger than the official Communist Party of Spain (PCE) both nationally and in the communist hotbeds of Catalonia and the Valencian Country, where the Unified Socialist Party of Catalonia (PSUC) represented the PCE. The POUM was highly critical of the Popular Front strategy advocated by Joseph Stalin and the Comintern; nevertheless, it participated in the Spanish Popular Front initiated by Manuel Azaña, leader of Acción Republicana. The POUM attempted to implement some of its radical policies as part of the Popular Front government, but they were resisted by the more centrist factions. George Orwell, who fought alongside the POUM in the civil war, reports that its membership was roughly 10,000 in July 1936, 70,000 in December 1936, and 40,000 in June 1937, although he notes that the numbers are from POUM sources and are probably exaggerated. The POUM's independent communist position, including opposition to Stalin, caused huge ruptures with the PCE, which remained fiercely loyal to the Comintern. Moreover, these divisions, which included accusations of Trotskyism (and even Fascism) by the Communists, resulted in actual fighting between their supporters; most notably, in 1937, a primarily Communist coalition of government forces attacked the POUM during the Barcelona May Days. While the larger CNT initially supported the POUM, its more militant members—such as Juan García Oliver and the Friends of Durruti—were pushed towards conciliation by the moderate leadership. This left the POUM, along with the purely Trotskyist Seccion Bolshevik-Leninista, isolated, and both organizations were driven underground. Nin was detained and tortured to death by NKVD agents in Madrid, and his party consistently labeled as provocateur in Stalinist propaganda. The POUM was a member of the "London Bureau" of socialist and centrist Marxist parties that rejected both the reformism of the Second International and the pro-Moscow orientation of the Third International. Other members included the Independent Labour Party in Britain, the Workers and Peasants' Socialist Party (PSOP) in France, and Poale Zion. Its youth wing was affiliated to the International Bureau of Revolutionary Youth Organizations, through which it recruited the ILP Contingent in the Civil War. Foreign supporters of POUM during the Civil War included Lois Orr. During the Spanish transition to democracy, the POUM was legalized in 1977. This led to a split in the party, with one faction opposing formal legalization, calling for a boycott of the 1977 general election and demanding the immediate restoration of the republic. The legalized party participated in the election as part of the Front for Workers' Unity (FUT), a coalition of parties and organisations to the left of the PCE which won 0.22% of the nationwide vote. The election result led to a crisis for the POUM as well as for most parties to the left of the PCE, from which it was not able to recover. The POUM continued to exist as a small party with an office in Barcelona and a monthly newspaper, La Batalla, calling for cooperation among the various far-left parties, but an attempted merger with Communist Action and the Collective for Marxist Unification failed during a "Unification Congress" in 1978. After this setback, the POUM decided not to participate in the 1979 elections. POUM branches in several cities became part of local coalitions and unification attempts with various far-left groups. In 1980, the POUM made its last electoral efforts, supporting Herri Batasuna in the Basque country and participating in the Left Bloc for National Liberation (BEAN - Unitat Popular) coalition in the Catalan parliamentary election, but the party was disintegrating. La Batalla ceased publication in May 1980, marking the end of the POUM as an organized party, though it was never officially dissolved. As a last remnant, the Valencia branch remained active until 1981. Former members of the POUM formed the Fundación Andreu Nin (Andreu Nin Foundation) to preserve the heritage of their party and ideological current. British author George Orwell fought alongside members of the Independent Labour Party as part of POUM militias; he recounted the experience in his book Homage to Catalonia. Likewise, the film Land and Freedom, directed by Ken Loach, tells of a group of POUM soldiers fighting in the war from the perspective of a British member of the British Communist Party. In particular, the film deals with his disillusionment with the Soviet Union's policies in the war. The POUM is briefly mentioned in Joe Haldeman's science fiction novel The Forever War as a militia where "(y)ou obeyed an order only after it had been explained in detail; you could refuse if it didn't make sense." Victor Serge dedicates Midnight in the Century to Andreu Nin and other slain leaders of the POUM. Discussion of POUM in Hemingway's For Whom The Bell Tolls (Collier edition, p. 247). El hombre que amaba los perros - Leonardo Padura's novel about Trotsky's murderer. ^ John Simkin. "The Workers Party of Marxist Unification (POUM)". Retrieved 12 August 2014. ^ a b Orwell, George (1980). "V". Homage To Catalonia. introd. by Lionel Trilling. New York, New York: Harcourt Brace & Company. p. 60. ISBN 978-0-15-642117-1. OCLC 9517765. The figure for P.O.U.M. membership are given as: July 1936, 10,000; December 1936, 70,000; June 1937, 40,000. ^ Haldeman, Joe (1974). The Forever War (First Avon Books Printing: May, 1991. ed.). New York: Avon Books. p. 209. ISBN 0-380-70821-3. J.R. Campbell, Spain's 'Left' Critics. London: Communist Party of Great Britain, 1937. Jesús Hernández, How the NKVD Framed the POUM. Excerpt from Yo Fui un Ministro de Stalin. Mexico City: G. del Toro, Mexico, 1974. Alan Sennett, Revolutionary Marxism in Spain, 1930-1937. Chicago: Haymarket Books, 2015. Wilebaldo Solano, The Spanish Revolution: The Life of Andreu Nin. Leeds: Independent Labour Party, 1974. Victor Alba, Stephen Schwarz. Spanish Marxism and Soviet Communism, A History of the POUM in the Spanish Civil War, 2009. Translation from Victor Alba's "La Revolución Española en la Práctica"
Documents on POUM from "Trabajadores: The Spanish Civil War Through the Eyes of Organised Labour," Modern Records Centre, University of Warwick. —Collection of more than 13,000 pages of documents from the archives of the British Trades Union Congress. This page was last edited on 6 January 2019, at 01:21 (UTC).